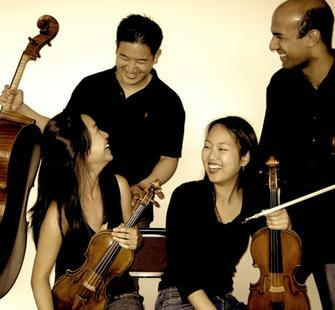 The all-Canadian Afiara String Quartet takes its name from the Spanish fiar, meaning "to trust." It has been said that chamber music is a conversation between friends; within the support of friendship, the Afiaras found that trusting each other, in rehearsal and on stage, was vital to the depth and joy of their music-making. Praised by the San Francisco Classical Voice as having "startling intensity" and a "powerful, keen-edged collective sound," the quartet is the Morrison Fellowship Quartet-in-Residence at the International Center for the Arts, San Francisco State University, where they serve as teaching assistants to their mentors, the renowned Alexander String Quartet. Only in their second year, the Afiara Quartet has performed at Carnegie Hall in the Kronos: Signature Works series, taught as resident faculty ensemble of Chamber Music of the Rockies, been invited to compete in the 9th Banff International String Quartet Competition, and made their New York debut in a Kronos-curated concert presented by Chamber Music America at St. Luke's Church. The quartet has been heard on KALW, CBC Radio 2 and featured in the documentary Road to Banff. The Quartet features Valerie Li and Yuri Cho on violin, David Samuel on viola, and Adrian Fung on cello.